In the United States, one of the first places to search for ancestors are US and state census records. 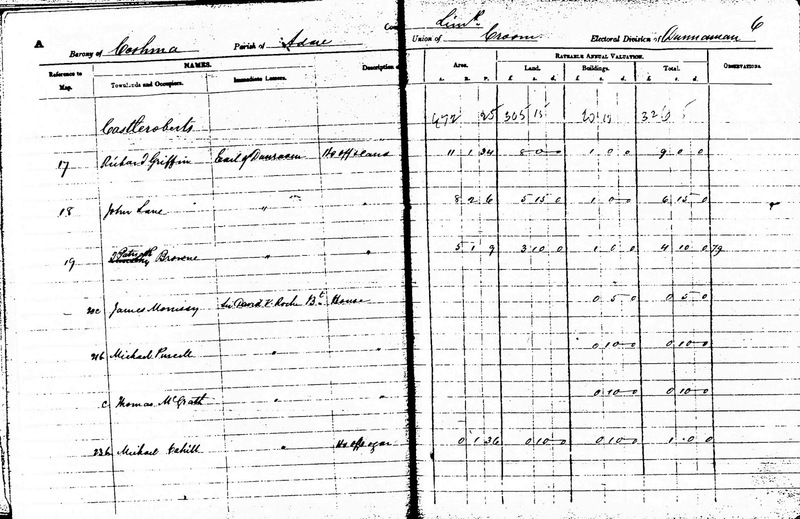 Unfortunately, the first intact census in Ireland is for 1901. Because of that, we look for a census substitute nearest the time frame when we know our ancestors were still living in Ireland. For the Browne family, the last record in Ireland is the 1847 baptism of Thomas, the youngest son of Timothy and Hannah Browne. The first record in the United States, that I had at the time of my research, was a baptismal record for Patrick Brown dated 27 Mar 1854, son of Patrick Browne, at St. Patrick Roman Catholic Church in Columbus, Ohio1. Patrick, the father, is the oldest son of Timothy and Hannah Browne and is one of the immigrants. So we know the family came to America between 1847 and 1854. Griffith’s Valuation is a tax valuation that was completed and published between 1846 and 1864. While it is considered a “land record,” information was collected on virtually every occupier in Ireland regardless of whether they owned land or not. In fact, relatively few people owned land, but, because of the destruction of so many records in Ireland, and because it includes records on much of the population in the country, Griffith’s has become one of the most significant census substitutes in Ireland. At the time I was initially researching the family, I used a website that is no longer available, Other Days. Now there are several online sites that provide access to records for Griffith’s Valuation. One free site is Ask About Ireland at http://www.askaboutireland.ie/griffith-valuation/. Other pay sites are also accessible online. They are: Roots Ireland at www.rootsireland.com, Ancestry.com and Find My Past at http://www.findmypast.com/. Ask About Ireland and Find My Past also provide maps, both current and historical, which makes it easy to locate the geographic location of your ancestor. Easy, that is, if you are sure of the location. As stated in an earlier blog, the Patrickswell church records did not provide the name of the townland. When I received the church records from the Limerick Archives, a map of the parish of Patrickswell and surrounding areas was included with the letter.2 (See the map at the left.) The map has proved invaluable in determining the specific location of the family. I quickly eliminated Timothy Browne #3 from Dollas Upper since he was not in close vicinity to Patrickswell, and is actually located about ten to fifteen miles southwest of the village. 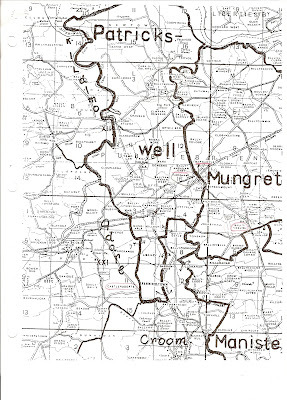 (Patrickswell is shown in the center of the map.) That left Timothy #1 and Timothy #2 who were not in the parish but were close enough to have traveled to Patrickswell for church events. Timothy #1, in Ballyveelish, was a couple of townlands to the southeast of the village and the church; Timothy #2, in Castleroberts, was adjacent to the parish of Patrickswell but still a few miles away from the church. So, I thought either of these two Timothys were candidates for our ancestor. The published version of Griffith’s is what we are used to looking at online. 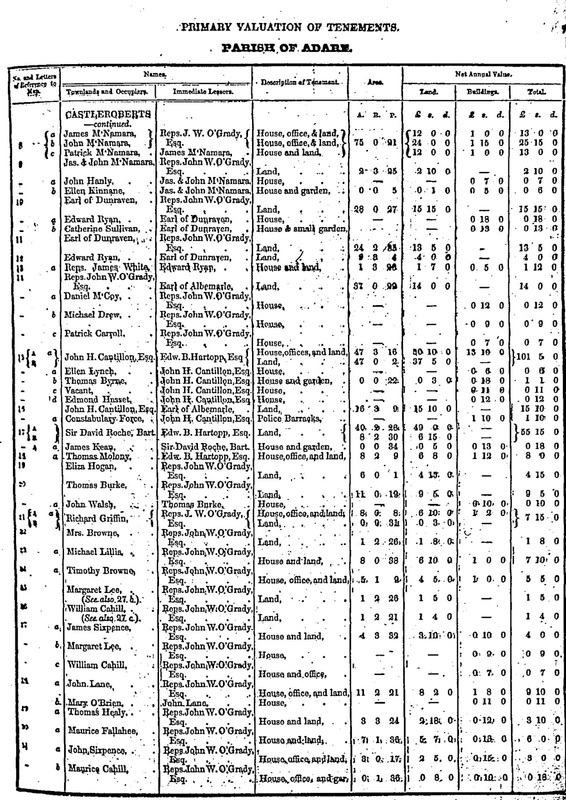 For the Patrickswell area, Griffith’s was printed in 1850-51. 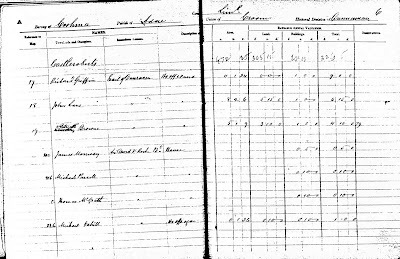 (See copy of the printed Griffith’s for Castleroberts at the right.3) The published version was compiled from handwritten notes, notably Field Books, Perambulation or Tenure Books, and House Books, collected while surveying and valuing each tenement.4 Cancelled or Revision Books were also created annually after Griffith’s was initially completed to record changes in occupiers or owners as well as improvements to each tenement allowing authorities to collect and adjust taxes appropriately.5 Revision Books continued to be updated until fairly recent times and can be used to track the history of a family or tenement. A wealth of information is contained in these records, and, depending on where your ancestors originated from, and the date Griffith’s was completed for the area, may provide more detailed information, and earlier information for the family. I have found that it took a period of time, from 12 to 18 months in some cases, to complete the valuation process before publication. And, during times of great change, such as the famine of the 1840s, the notes can provide information not appearing in printed records. While it was intended to make the House and Tenure books available online by the National Archives of Ireland sometime in 2015, (see information in the Irish Genealogy News blog at http://www.irishgenealogynews.com/2015/02/digitisation-plans-for-griffiths.html), they have not yet become accessible and obviously were not available online in 2005 while doing my research. They are, however, available on microfilm from the Family History Library. I decided to use these records to determine which of the two Timothys, if either, was our ancestor. Timothy #2 is shown in the Revision Books until 1879, well beyond the date our family arrived in America; so he can be eliminated.6 (See copy of the Revision Book to the left.) The Tenure Book for Timothy #1 was created in December of 1847, a time when our family should have been in residence.7 The published version of Griffith’s shows Timothy Brown in tenement 1a with 157 acres. The Tenure book shows David Carmody in residence at that tenement with a 45 year lease that had expired. Timothy #1 could have taken up the property between the time the lease for David Carmody expired, 1847, and the time Griffith’s was published in1850; however, in the meantime, I found another piece of information which eliminated him from the running. 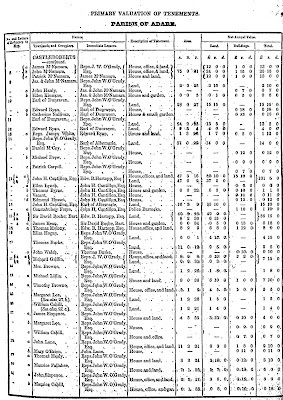 I had finally located a ships passenger list for the family that arrived in Boston in January, 1849. I will save that discussion for a future blog when we look at our family in America. I also want to look at Timothy #2 again in the future. His is an interesting story and we very well may be related to him. That will require more research to determine. However, the next blog will tell the nitty gritty about how the townland for our Timothy was finally found. 2. 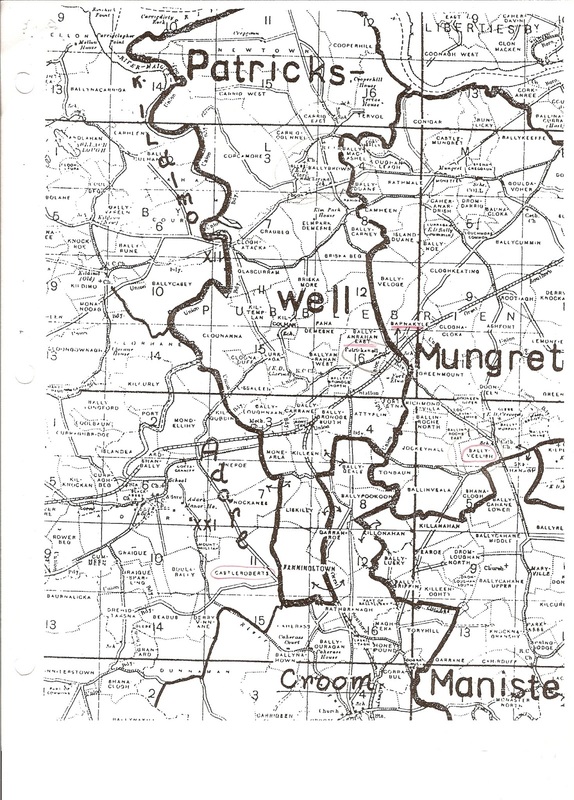 Map of Patrickswell RC Parish and surrounding parishes, from Limerick Archives, 2003. Parish divisions are superimposed on a Townland Index Map. Dotted lines indicate townland boundaries. 5. Ibid, pp. 38 and 43-47. Thank you for sharing this Mary Ann.I am interested to learn more. I am amazed at your research know how. The best source I have found for learning about Griffith’s Valuation and the supporting documents used to complete the valuation is a book by James R. Reilly titled, Richard Griffith and His Valuations of Ireland. He goes into detail about what information is included in each manuscript and where to locate the sources. Because the House and Tenure Books are not yet available online, it has taken a long time to order and review many microfilms from the Family History Library. In future posts, I plan to include samples of the House and Tenure Books. I hope you find them interesting.